On September 17th the members of the Magnolia Fire Co. will be enjoying 120 years of service to the residents of Magnolia. We will be inviting all of the members of the our organization to show up and share their memories. Our oldest member is Howard Shimp (84), our longest serving member is Past Chief Tom Euler (55 years). We will also like to show our past in all of the pictures we can muster up. We would like to ask our residents to drop off any pictures that they wouldn't mind parting with, that shows us involved in town functions, on fire calls, or Christmas Eve with Santa. Members please feel free to contact us if you would like to be a part of our celebration. We will providing food & refreshments on Tuesday evening with a start time of 6:30 p.m. The Magnolia Fire Co. recently was approved for a loan to allow us to finish our Fire Station. After more than 2 years we will be able to look at more than 2x4 studs, exposed rafters, and lights cords strung from the ceiling. firefighting to carpenters at any given time. We are being led by Deputy Chief Mike Wolf who is chairman of renovations he is the one making all this come together and become a reality. The work being done now is to our main floor, that includes our Meeting/Training Room, and the completion of our TV/Bunkroom. Members have been volunteering their Sundays, Tuesdays, & Wednesdays to try and give us someplace we can call our own and be proud of. Through the hard work of President Chris Merulla we were finally able to obtain our loan. Loans aren't easy to come by when our income is based on all fund raisers. We have been actively scheduling hoagie sales, we hold our St. Patty's Day Social, we are currently sponsoring a raffle for Phillies tickets, 6 seats in Section 113 on the field and includes preferred parking, for a donation of $5.00 a ticket. See any member if you are interested. We hope to have our project completed by the end of 2013 if our funds last. 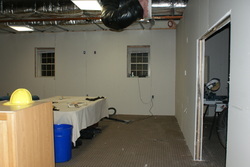 The next project is our Engine Room & Control Room. Some of this might only end up as a dream unless the economy changes. Funding or grants for Volunteer Fire Companies aren't easy for small towns like Magnolia. Our volunteerism will not waver in any case, we will be there for our residents. We have been in business since 1893 and we are celebrating our 120th Anniversary on September 17th. There will be no celebration, other than thinking about and thanking all of our founding and past members who allow us to carry on a tradition they started. Chief Paul Wolf saved the residents of Magnolia over $55,000.00 with applying for an available grant. The grant was put in for the replacement of our old air bags and rescue tools, our intitial request was for close to $95,000.00. This grant was completed with the help of Mayor & Council along with the borough's financial department. A percentage of the grant has to be matched by our borough in order to get the paperwork started. The new equipment will be placed in service on Utility/ Rescue 29 in the next few weeks. We will have it on display on National Night Out and at our Fire Prevention Open House on Saturday October 6th at the Magnolia Recreation Center. We are trying to replace and update our aging equipment without burdening our residents. We recently replaced and upgraded all of our Air Packs 2 years ago. This was thanks to Past Chief Gary Reibel. We are now applying for a multi town grant to replace our 20 + year old hose and appliances (nozzles).